Get a Free Extra Chain (26RM3 74 or 26RM3 81) and a 6 pack of 2.6 oz. HP Ultra Oil with purchase of a Stihl MS 271 Farm Boss or MS 291 chainsaw! Up to a $42.89 value. PLUS! Double Your Warranty at no additional cost! Check out all the Stihl Special Offers going on here. 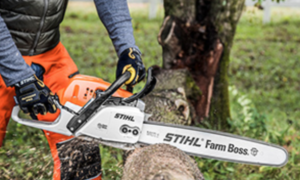 Bringing reduced-emission technology to mid-range chainsaws, the Stihl MS 271 Farm Boss is ideal for felling, firewood cutting and storm cleanup tasks. An improved low-emission, the fuel-efficient engine cuts emissions by 50% when compared to previous models and delivers 20% longer run times than traditional 2-stroke engines. Designed with user comfort in mind, its compact, ergonomic design and advanced anti-vibration system help to reduce operator fatigue while providing optimum control. Note: STIHL recommends #3634 (26 RM3 67) OILOMATIC® saw chain and 16″ 3003 812 6813 Ematic™ guide bar combination. The actual listed guide bar length can vary from the effective cutting length based on which powerhead it is installed on. Equipped to handle demanding tasks, the Stihl MS 291 increases running time by 20% over previous model. Packing plenty of power, this chainsaw is ideal for felling, firewood cutting and storm cleanup. Several user-friendly features include an advanced anti-vibration system that reduces operator fatigue and side chain access for easy saw chain adjustment. The MS 291 is a dependable choice for a mid-range chainsaw. Note: STIHL recommends #3634 (26 RM3 67) OILOMATIC® saw chain and 16″ 3003 000 6813 Ematic™ guide bar combination. The actual listed guide bar length can vary from the effective cutting length based on which powerhead it is installed on. This entry was posted on Thursday, September 6th, 2018 at 2:17 pm	and is filed under Lawn & Garden, News & Updates, Specials. You can follow any responses to this entry through the RSS 2.0 feed. Both comments and pings are currently closed.